Deters pigeons, blackbirds, starlings, sparrows, seagulls, etc. Bird-X Transonic Mole and Gopher Chaser flashes, buzzes and vibrates to scare away moles, gophers and other creatures burrowing in your yard. It emits a burst of sound and vibration every 20 seconds and its lights flash every 5 seconds for continuous, effective operation. This solar-powered unit is safe for use around your family and pets. Effective coverage up to 50 ft radius (approximately 7,800 square feet). Defend your yard and garden from destructive nuisance animals with the Critter Ridder Motion-Activated Repellent. Using a built-in sensor, this unit is able to detect movement from up to 100 feet away (depending on conditions). When the sensor is triggered, the repellent delivers a jet of water toward the animal for approximately 5 seconds. Most animals are startled by the sudden burst and scurry away. This unit is ideal for repelling a variety of animals including raccoons, opossums, cats, dogs, and other animals with potentially destructive behaviours. In addition to providing an animal-repelling solution, the Critter Ridder Motion-Activated Repellent can also be used as a sprinkler unit for watering lawns or gardens. Simply set the dial to "Sprinkler" mode, which activates a continuous spray or water. Switch the dial "OFF" once the area is sufficiently watered. Plastic Bird Spikes 50 Foot Kit Guaranteed Bird Repellent Bird Control Block pest birds from their favorite landing and roosting surfaces with Bird-X Bird Spikes. Tough, long-lasting polycarbonate material provides maintenance-free protection. Transparent material doesn't mar the look of a building. The spikes function as a 'keep-out' sign for birds. The density of spikes is branched from the vertical shafts to offer impenetrable coverage. Spikes allow mounting on most surfaces and are easy to install with adhesive (not included). Each foot of spikes covers one linear foot, and a "spread" or width of up to 6 inches. It's the most effective, inexpensive, and permanent solutions to keeping those annoying birds off any commercial or residential surface. 50 one-foot sections per box. Plastic Bird Spikes 50 Foot Kit Guaranteed Bird Repellent Bird Control is rated 3.3 out of 5 by 3. 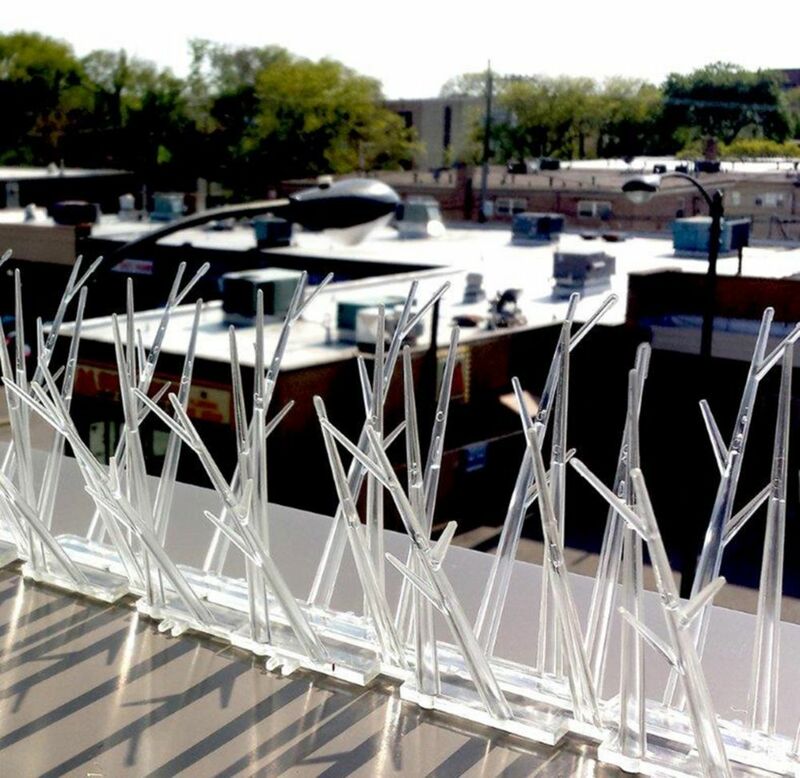 Rated 5 out of 5 by MPConner from Effective bird deterrent The bird spikes were a great deterrent to our bird problem. Birds were roosting and leaving messes below. After east installation of bird spikes with screws or velcro, the birds were redirected to roost somewhere else. A great purchase with easy installation and instant results! Rated 1 out of 5 by Tank from Poor Quality I wasted my time and money to install these light weight plastic bird spikes that lasted less than one year. They do not stand up to the UV rays and they became brittle and broke very easy. Next time I am using an all stainless steel product. Rated 4 out of 5 by tcflood from Does what it is supposed to do The plastic is very tough and installs straightforwardly. Probably is less obtrusive than metal would be, but I have not used metal. I have no complaints. It does what it is supposed to do.